If you have recently acquired contact lenses for the first time in your life, it can be a nerve-wracking experience trying to fit them into your eye if you are unsure what to do. 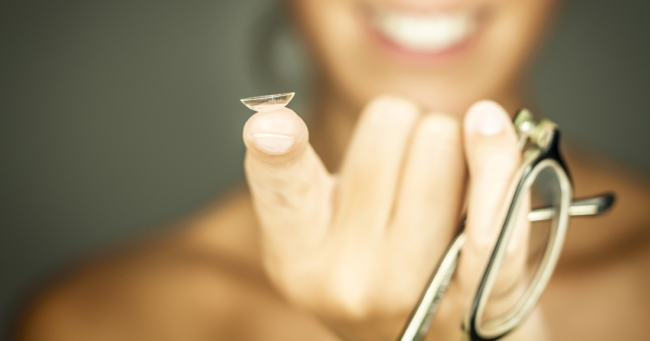 Part of our goal at Mountain Eye Care is to educate and help patients when it comes to everything eye related, so we would like to offer our readers some tips and tricks for anybody who is experiencing their first time wearing contact lenses. Keep reading to find out! Just like anything in life- practice makes perfect. It is a good idea to practice putting your contacts in and taking them out so you can get used to the feeling and the routine. Upon receiving your prescription and obtaining your contact lenses, your eye doctor should have gone over the procedure for inserting and taking out your lenses. For a refresher on the process, or if you would just like to learn some tips, check out our list below. First and foremost, always wash your hands when you are putting in and taking out your contact lenses. Be gentle! Contacts can tear easily. Check to make sure your contact is not inside out before inserting it into the eye. Lubricate, lubricate, lubricate- it is always a good idea to place a drop of lens solution on your contact before putting it in. Blink a few times after the contact is inserted into the eye to make sure it is in correctly and won’t fall out during the day. Do not sleep in your contacts as it is bad for the lens and for your eyes! Remember to always take them out at the end of the day as they can dry out and irritate your eyes. There is always an adjustment period needed for the body and brain when it comes to newly acquired eyewear. Eyes need to get used to seeing through corrective lenses, be it glasses or contacts. Typically between one to two weeks is required for your eyes to adjust to the prescription fully. So be patient, and relax. Your eyes will become used to the contacts in no time, and wearing these lenses will become second nature! We hope the above information has helped to prepare yourself for the first time wearing contact lenses. If you are still nervous or unsure about the process, you can visit us in store at Mountain Eye Care, or contact us online.